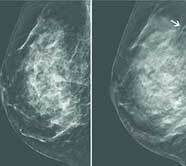 Digital breast tomosynthesis improves detection of breast cancer. Digital breast tomosynthesis, also known as 3D mammography, is an advanced breakthrough in breast screening that improves the detection and treatment of breast cancer. Digital breast tomosynthesis offers a more accurate view of the breast, enabling doctors to pinpoint abnormalities earlier and more effectively. Pioneered by experts at Massachusetts General Hospital, digital breast tomosynthesis is available to patients on the North Shore through the Mass General/North Shore Breast Health Center, a collaborative program between North Shore Medical Center and Mass General, providing comprehensive breast health care at convenient locations throughout the region. What is digital breast tomosynthesis? Learn more about tomosynthesis mammography and the Breast Health Center. Digital breast tomosynthesis is an imaging procedure that provides a three dimensional view of the breast. Traditional 2D mammography results in a single, flattened image of the breast and makes it difficult for physicians to detect smaller cancers. Digital breast tomosynthesis provides a more accurate view of the breast by taking images from multiple angles and combining them to create a three dimensional rendering of the entire breast. With tomosynthesis mammography, breast radiologists can manipulate the viewing angle to get better images of areas of concern. The benefits of digital breast tomosynthesis. Pinpoint the size, shape and location of abnormalities with greater accuracy. Detect small breast cancers earlier, particularly cancers that may be hidden from view in a traditional mammogram. Reduce unnecessary biopsies and additional tests. The Mass General/North Shore Breast Health Center provides women in the North Shore region with the highest caliber of care in a supportive atmosphere. Our team of physicians, breast cancer surgeons, radiologists, imaging technologists and nurses – all specialists in breast health – are dedicated to providing compassionate and confidential care designed for the individual needs of each patient. In addition to digital breast tomosynthesis, we offer comprehensive care, including a full spectrum of screening and diagnostic exams. Traditional mammography is available at multiple NSMC sites in the community, and digital breast tomosynthesis mammography is available at facilities in Salem and Danvers. More advanced care – including breast MRI and breast surgery – is available at the Mass General/North Shore Center for Outpatient Care. Breast cancer treatment is provided at Mass General/North Shore Cancer Center and NSMC Salem Hospital. Learn more about breast health and breast cancer. Learn more about other services provided by NSMC, including back pain surgery, lung cancer surgery and cardiac ablation for atrial fibrillation.